Chief Aikulola Fawehinmi Nathan Lugo, our temple’s leader, is a titled Ifa priest, priest of Obatala, and priest of Egungun, and furthers his priestly skills under his master priest Chief Fakayode Faniyi as well as his elders in Obatala and Egungun. He is the Gbawoniyi Awo of Osogbo’s Idinleke Ifa Temple, the Oluwin-Oosa of Oyo Alaafin (a high-ranking Obatala priest chieftancy title), and has a host of Orisa shrines that he has been properly trained to appease and consecrate. Chief Aiku is an official member of all these four religious orders: Osogbo’s Ifa society, Osogbo’s Egungun society, the Iledi Ohuntoto Ogboni lodge of Osogbo, and the Obatala society of Oyo. Our Gbawoniyi speaks the ancient Oyo dialect of Yoruba language still preserved and spoken in today’s Nigeria as it was in ancient times. In addition to Yoruba, he also speaks fluent Spanish and English and travels to countries such as Venezuela, Mexico, Spain, Cuba, United States, and Nigeria where he is a respected religious community leader and teacher. Chief Aikulola, of puerto rican parents, is a model of excellence for all latinos that embrace their african heritage as well as other pan-africanists and lovers of culture and indigenous peoples. ***I pay homage and show deep love and appreciation to the individuals that with their deep knowledge and goodness have made me what I am today. May the Olodumare and all the Irunmole continue to bring abundance, joy and peace of mind into their lives. …I also send warm thoughts to all my omo awo/omo orisa here in the states and in other countries as well as my brilliant and kind godbrothers and sisters in Nigeria and here in the states (yes, that is you ATL). Its good to know we are family…blood truly is thicker than water. ***And I can joyfully, confidently, and authoritatively say that women can and do get initiated to Ifa as they have for many generations in many part of Yoruba land. This comes from years of travel and living in Yoruba land and from being able to train and communicate solely in Yoruba language in Nigeria. I’m also a faithful and proud member of Ajo Olorisa Agbaye (Orisa World Congress) and NOT a member nor supporter of the Ifa Council. He is the Gbawoniyi Awo of Osogboland, a high-ranking chieftancy title in Osogbo’s Ifa priesthood and a member of Idinleke Ifa Temple of Osogbo and has a host of other Orisa shrines that he has been properly trained to appease and consecrate. Chief Aiku is an official member of all these three religious orders: Osogbo’s Ifa society, Osogbo’s Egungun society, and the Obatala society of Oyo. Our Gbawoniyi speaks the ancient Oyo dialect of Yoruba language still preserved and spoken in today’s Nigeria as it was in ancient times. 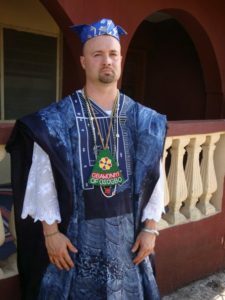 In addition to Yoruba, he also speaks fluent Spanish and English and travels to countries such as Venezuela, Mexico, Spain, Cuba, United States, and Nigeria where he is a respected religious community leader and teacher. Chief Aikulola, of puerto rican parents, is a model of excellence for all latinos that embrace their african heritage as well as other pan-africanists. Chief Aikulola is available for all your spiritual needs and educational growth in Yoruba culture and spirituality. Our community is open to all those seeking an african spiritual path directly from West Africa. help with money, love, adversaries, etc.